I met the challenge… the Daring Bakers challenge that is! 4.Â Line 1 or more sheet pans with baking parchment. Place the buns approximately 1/2 inch apart so that they arenÂ´t touching but are close to one another. 6. Preheat the oven to 350Â°F (175Â°C) with the oven rack in the middle shelf. 7. Bake the buns for 20 to 30 minutes, or until golden brown. 8. Cool the buns in the pan for about 10 minutes and then streak white fondant glaze across the tops, while the buns are warm but not too hot. Remove the buns from the pans and place them on a cooling rack. Wait for at least 20 minutes before serving. I brought the buns to my friends’ house for dessert. We all loved them and found it hard to resist eating all of them!! Congratulations and welcome! Nice buns, heh. Congrats on your first challenge! IÂ´m glad you liked the buns. Looks like you have been making them all your life…well done. mmmm…perfect and round (mine cme out on the square side for some reason)! great job on the challenge! Congrats on being all daring, and getting that first challenge done. Great buns! Congratulations! :) The buns look great! Great job and welcome to the DBs! ABsolutely lip smacking good Bruno! Great job on your first challenge! Great job on your first challenge. Welcome to our crew!! Beautiful! Welcome to the DB! You certainly have met the Daring Bakers challenge, Bruno! Well done! 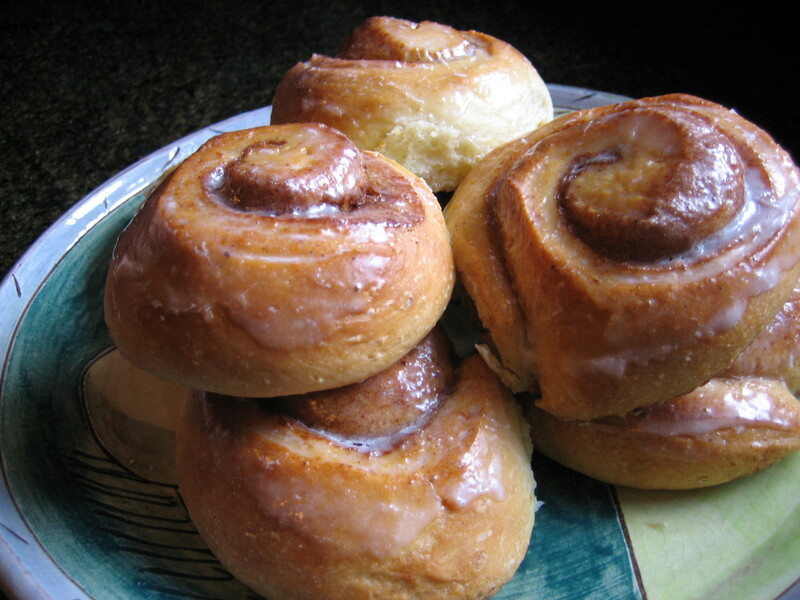 Your buns looks delicious and I learn something new from your blog on these buns. I tend to roll out my bun a bit thin. Perhaps that’s why it doesn’t taste as good. Whoa! The glaze reminds me of the Krispy Kreme glaze. Awesome! Welcome to the Daring Bakers! It looks like you aced your first challenge with those tight, neat rolls. Deborah – Thanks! I’m looking forward to the next challenge. Maria – Thank you! The light glaze added just the right amount of sweetness. Aoife – Thanks so much! I enjoyed the challenge. Awww Bruno, they turned out beautifully!! I’m so happy you and your guests enjoyed them! I can’t wait to see what you create next month! Well done Bruno! The orange zest would have been really good too. Yes…bun enhancement…let’s not go there..sigh. I think your friends love you for your buns! Good job! Brilynn – Thank you! The orange zest added a nice touch. Your first challenge turned out great! Welcome to the Daring Bakers!! Thanks Andrea! I’m enjoying the Daring Bakers…. I’m no longer a part of the group but I’m glad to know you are – the buns look amazing!